Salmon has has long been a favorite of mine. In recent years, however, I have been trying to buy more wild-caught salmon as opposed to farmed. The downside: limited availability and (where we live) high cost. When I noticed a year or two ago how inexpensive canned wild salmon is, I decided to start using it in some recipes. 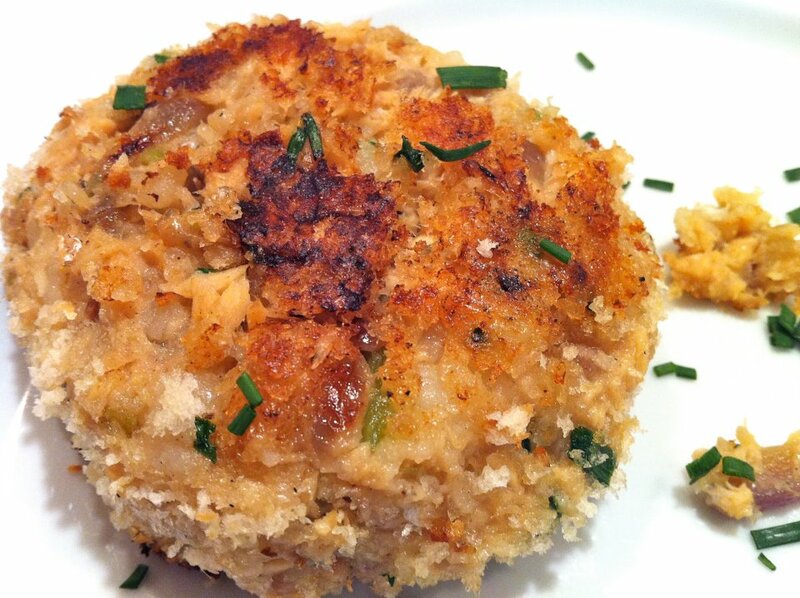 Typically, I make a simple salmon cake, varying the recipe each time. When my sister-in-law popped by for a visit the other evening as I was scooping the insides out of baked potatoes for Baked Eggs in a Potato–which are heavenly, by the way! (see note)– she mentioned that she likes to use leftover mashed potatoes in her salmon cakes. So, I figured, why not try?! She often uses leftover salmon, not the canned variety. You can do the same. She also mentioned that she doesn’t measure the potatoes; it all depends on how much she has leftover. For the sake of a recipe, I measured out what I used, but you may use it as a framework, adding more or less potatoes, using parsley instead of chives, or adding a teaspoon or two of Dijon mustard and about a quarter cup of Parmesan cheese (which I thought about AFTER I had them all made into patties, and I think would be yummy!). Saute the onion and celery (in a tablespoon or so of olive oil) in a large skillet or cast-iron pan over medium heat until tender and a little browned. If you have some leftover chicken stock or wine, using it at this point to deglaze the pan will help you scrape up all those little crusty, flavorful pieces that otherwise stay in the pan. Let cool a bit and transfer to mixing bowl. Wipe out your skillet and add another tablespoon or two of olive oil for sauteing later. To the onions and celery, add the salmon, potatoes, chives, and salt and pepper, to taste. (Add the Dijon and Parmesan, too, if that sounds good to you.) Mix well, then form into patties about the size of a quarter-pound hamburger. If desired, dredge them in the panko. I prepared mine both ways and they were equally delicious. The panko, however, will add a little extra crustiness to the outside. Refrigerate until ready to cook or for 20-30 minutes to allow patties to firm up a bit. You could certainly prepare these in the morning, cover, and store in the refrigerator until dinnertime. When ready to eat, saute in the olive oil over medium-high heat until golden on both sides and heated through. Reduce heat to low if the salmon cakes are sufficiently browned but not quite heated through. The main ingredients are already cooked, so you just want them to be hot on the inside and a little crusty on the outside. Serve with cocktail or tartar sauce, if desired. Most of my family used some of my homemade ranch dressing which was a delicious twist. My younger son asked for salsa which supplied a nice flavor kick. Leftovers, if you have any, make a fabulous lunch the next day. Making smaller patties for salmon sliders would be a fun twist. If you make the Baked Egg in a Potato recipe one night, you will have the extra insides to use for the salmon cakes and the leftover skins for Easy Potato Skins! Recipes in photos section. I used shredded potatoes because that’s what I had around. They browned up nicely and were nice with a fresh broccoli slaw on the side. Cindy, I loved that you used shredded potatoes. It’s a brilliant shortcut for all the times leftover mashed potatoes aren’t on hand, and I never thought of it with this recipe. Thanks so much for mentioning. I, for one, am going to try your suggestion!